A Chicago-based nonprofit is supporting the Midwest Center for Investigative Reporting in establishing a fellowship that will help the nonprofit news operation engage more deeply with rural communities. MCIR is recruiting for an engagement fellow in partnership with Illinois Humanities, which works to build democracy by stirring dialogue through programming, events and grantmaking. The fellow will focus on diversifying MCIR’s audience by involving community members in the newsroom’s editorial process and fostering conversations about its coverage. “The question that we’re trying to answer really is, can a dedicated engagement operation in a newsroom like that help strengthen the relationships the newsroom has with the community, deepen its audience and ultimately result in better, deeper investigative journalism that wouldn’t have happened otherwise?” said Simon Nyi, program manager of media/journalism and business for Illinois Humanities. The fellowship grew out of “Reporting Back,” a series of town halls staged by Illinois Humanities where Chicago reporters shared their progress on stories and solicited feedback from the community. The nonprofit’s focus on that kind of engagement-based journalism took on new resonance at its annual conference in November, which was held days after the presidential election. As the media and a swath of the public struggled to understand Trump’s win, the election underscored a need to listen more closely to rural Americans, Nyi said. “We couldn’t possibly have planned things to shake out the way they did, but it gave what we were talking about a new urgency,” Nyi said. As it begins working with MCIR, Illinois Humanities is advancing its efforts to aid engagement in smaller newsrooms. The most innovative engagement projects tend to come from larger, well-resourced newsrooms in major metropolitan areas, Nyi said, such as ProPublica. Nyi said that MCIR’s small staff consistently produces quality work that doesn’t “often get the broader regional or national play I think they deserve,” such as the center’s coverage of poor living conditions among farmworkers. If some of their stories were originated by Chicago outlets, “they’d be all over the place,” Nyi said. Both Illinois Humanities and MCIR see the yearlong fellowship as an experiment and learning opportunity that will yield lessons to help the broader field of community engagement. It’s also an opportunity for the Chicago-based nonprofit, which has a statewide mandate, to step outside the city. Engagement positions go beyond social media to focus on building relationships in a substantive way. But organizations are still working through what that means. “The engagement, the real human-relationship building with a community” isn’t just holding a panel with experts but baking engagement into the editorial process, Nyi said. MCIR started in 2009 to focus on agriculture and agricultural business. Those beats are important to residents of central Illinois, but covering them was straining mainstream news organizations suffering from deep cuts to their staffs and funding, said Brant Houston, an MCIR board member and co-founder of the Institute for Nonprofit News. The center’s stories are published by local news outlets and carried on NPR, so Houston says the fellowship will be a community service. Houston hopes the community engagement role will help build the community’s awareness of MCIR. Audiences sometimes credit other organizations with MCIR’s work, he said, hurting its public recognition and contributing to skepticism about its work. The engagement fellow’s work will also strengthen the image of rural communities, an especially important goal given perceptions that East and West Coast media don’t understand the Midwestern audience, Houston said. 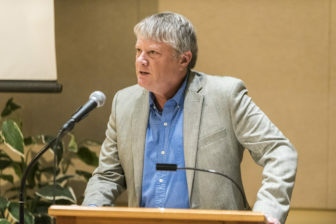 A successful fellowship will build awareness of MCIR, create the “equivalent of a very broad, digital Rolodex” to broaden MCIR’s sources, and develop expectations that every project will be discussed publicly “so there’s a greater understanding of the role of the media and press,” Houston said. He also expects the fellow to coordinate with statewide NPR stations in areas such as events and sharing of content. The $38,000 position is funded by the Robert R. McCormick Foundation, the National Endowment for the Humanities and private grants. Applications are due by April 10. “This is yet another sign that the public is willing to pay for quality journalism,” said Jennifer Preston, Knight Foundation’s VP of journalism.